It’s been six years since scientists confirmed the existence of a long-theorized particle called the Higgs boson, finally providing an explanation for how other particles acquire mass. The Compact Muon Solenoid (CMS), a particle detector built in an underground cavern in Cessy, France, on top of the Large Hadron Collider. Conditions on Earth make it extremely difficult to detect this mysterious particle, which is why discovering it took the world’s single largest machine — the Large Hadron Collider at the European Organization for Nuclear Research (CERN) — and thousands of scientists from more than 100 countries. 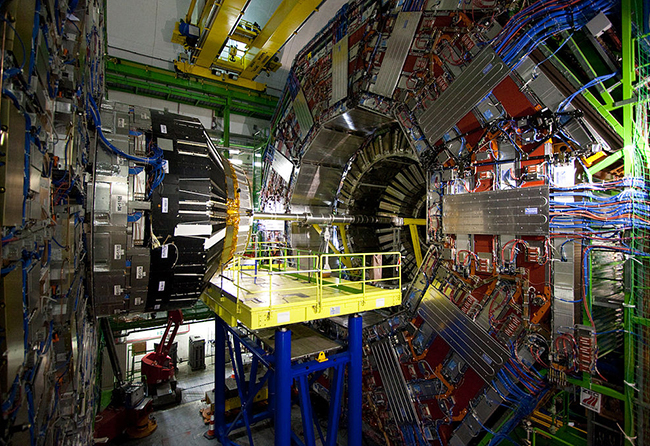 Eager for more answers about the deep hidden structure of nature, physicists at CERN have been searching nonstop for further clues about the Higgs boson and how it interacts with other particles. Years of data and trillions of high-energy particle collisions at the Large Hadron Collider (LHC) later, victory was reached once again this month with a discovery that links the Higgs boson and the top quark — an interaction that Brian Winer, professor and chair of the Department of Physics, has been searching for since before the Higgs was proven to exist. Winer and several other Ohio State researchers played a principal role in the search for this remarkably rare event through their collaboration on the CMS experiment at the LHC, which published the new results on June 4 in the journal Physical Review Letters. “The top quark is the heaviest of all the quarks, and because the Higgs boson gives mass to other fundamental particles, the theory predicts it should interact quite strongly with the top quark,” Winer explained. To test this connection, scientists looked for evidence of a unique case in which the Higgs boson is produced along with a top quark and an antitop quark in the same collision (called ttH production). And the rapidly decaying nature of these particles means that ttH production can’t actually be observed — it must be measured by working backward through a complicated chain reaction. On top of that, many other kinds of collisions produce similar end results.